Switching your business telephone systems to VoIP can be a big cost saving for any business. However, upgrading to new technology is often seen as expensive in itself. Whilst there is often a cost involved in updating to the latest hardware or software solution VoIP does buck the trend – you can see immediate returns on investment from a switch to VoIP, even when you include the costs of the required equipment. 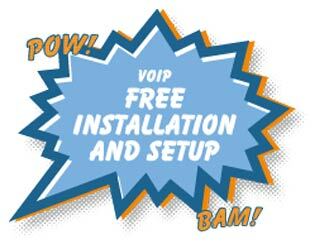 Here at Your IT we offer VoIP systems as part of our integrated packages of Information & Communications Technology. Many of our Managed IT Support clients choose to move either existing VoIP solutions over to our platform or switch from traditional phone systems due to the cost savings and flexibility offered by VoIP. Having both your IT and telecoms supported by the same provider means a more integrated service, easier access to support for your staff and, often lower costs. How does VoIP cost less? On site phone systems are expensive. Upfront costs are high and you’ll have support costs, maintenance and upgrades to factor in to your total cost of ownership. This technology is becoming outdated – BT will cease taking orders for Public Switched Telephone Network (PSTN) and Integrated Services Digital Network (ISDN) in 2020 and customers will have to find IP based solutions. This technology will be phased out completely by 2025. If you are thinking of installing a new internal telephone exchange just don’t! As of early 2017 there were over 2 million businesses still with an ISDN connection in the UK [Ofcom], all of which will be affected by the planned switch-off. A 2017 survey also showed that a quarter of the UK’s businesses are still unaware that the switch-off is even taking place. VoIP allows drastic savings as there are no requirements for the servers associated with on-site systems. Everything is handled off premises –“in the cloud” – so no upfront costs and no ongoing maintenance etc. As everything is handled online updates and changes are simple and quick, often taking place in the background whilst you work or out-of-hours – so no on-site visit from expensive technicians with considerable downtime. This means real scalability as new users are incredibly simple to set-up. Call costs are lower too, on average 35% – 75% lower and you can save even more if you’ve got multiple offices as calling between them can be set up so that it’s free. There are also call bundles available to make even greater savings. In many cases, monthly phone costs become a fixed cost as all calls are included within the bundle – making it far easier to budget. VoIP also comes with a number of enhanced features, many of which we’ve covered in previous posts such as Call Hunting, Find Me/Follow Me, and Interactive Voice Response. You’d have to pay extra for these kinds of enhancements on traditional systems but with VoIP they are included. So just how much are we talking? Savings will generally be made for any business moving from a traditional phone system to VoIP, however, in pounds and pence, the savings will be greater for higher phone users with a greater number of lines. In a real-life scenario we have a client with approximately 40 extensions whose current phone charges were averaging at around £1200 per month, however, these would increase at peak times. A VoIP solution would cost around £800 per month and this would include ALL required equipment on a rental basis. This is a 33% saving, in this case, £400+ per month or around £5,000 per year. In any business that is significant. Isn’t it a lot of hassle? As with any solution we put in place we’ll project manage from start to finish and work with you and your existing provider to minimise downtime. We’ll help make sure that you keep existing numbers and that you suffer no loss of service to your customers. We’ll often complete work out of hours to ensure you suffer as little disruption as possible. I’m interested, what’s the next stage? Don’t blindly renew! A little time and effort can save a lot of money. In the example above a new 3 year contract would mean shelling out over £15,000 too much! Send us a bill. With some basic information, we can soon ascertain just what type of saving you can make. Take Action. Even if you don’t believe you can save money don’t forget the ‘Switch Off’. 2025 might seem a long way off but it will soon be here and you do not want to get left behind.